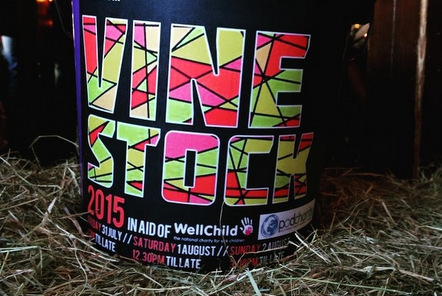 Last weekend saw the return of local music event Vinestock which was in aid of Pod Charity and WellChild. We were thrilled with how the event went and with how much money was raised for the charities! We are delighted to announce that the event raised a total of £2023.15 which is split between Pod Charity and WellChild! As 100% of the money that has been raised for Pod Charity will go overseas, this means that we will be able to make 4 charitable grants to the projects we work with around the world. Fundraising was through three main channels; we sold raffle tickets, asked people to pay to guess how many sweets were in the jar and had collection tins and buckets at the event. We’d like to start by thanking everyone who contributed to the charities in all of these ways. We have a huge number of thank yous to make as a lot of people were involved in making the event such a success. First of all thank you to the Cheltenham Underground for organising and promoting the whole event. Thank you to The Vine for hosting the event; for taking out the tables and chairs, rolling out the turf and stacking the hay bales and to all of the staff for working so hard over the weekend. Thanks to *Calmer for organising the music on the Sunday. Thank you to BBC Gloucestershire, Radio Winchcombe and Behind the Scenes Gloucestershire for helping to promote the event. A massive thank you goes out to all of the acts who played over the weekend; we think it was the best Vinestock yet (and we particularly enjoyed joining the conga line with Emmett Brown)! We’d like to say a special thanks to Howard Sinclair and Dan Hartland who donated half of their album sales on the day and to #CuddleSquad who took the bucket round for us to get extra donations. We would also like to thank Jack the sound engineer, who both ensured the music sounded great all weekend and also donated part of his fee to the charities. Thank you to Real Burger for providing the food for all of the acts over the weekend. With regards to the raffle, we’d like to thank Typecraft who printed the tickets for us free of charge, to The Swan, The Vine, The Railway and The Frog and Fiddle for letting us sell tickets in their pubs. We’d also like to thank Festival House, Brightsource and Kingspin Barbers for selling raffle tickets in their premises. We also of course need to thank all of companies who donated prizes for the raffle and sweets jar: 2000 Trees, Ellenborough Park Hotel, The Vine, The Swan, The Railway, Stuart Holmes Hairdressers, Venture photography, Journeys Are Made and Wilkinsons. Finally a big thank you to everyone who came to the event, we hope you enjoyed it as much as we did and we look forward to seeing you at Vinestock 2016! If you would like to learn more about Pod Charity please click here.